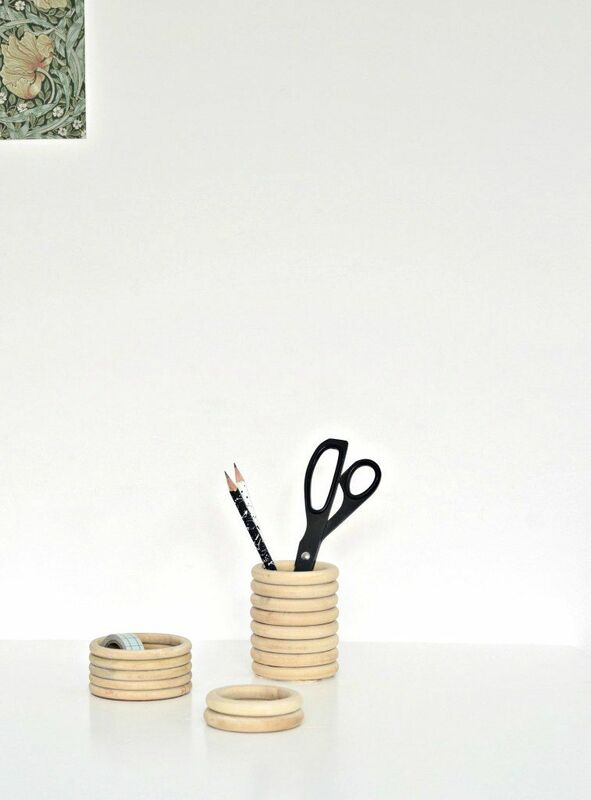 Whether you want to kick off the new school year with a funky DIY project or to make something cool and original for your office, a DIY pencil holder is a great idea which can materialize itself in lots and lots of interesting ways. We’re put together some of our favorite projects on this subject and we can’t want to share them with you so let’s get started. 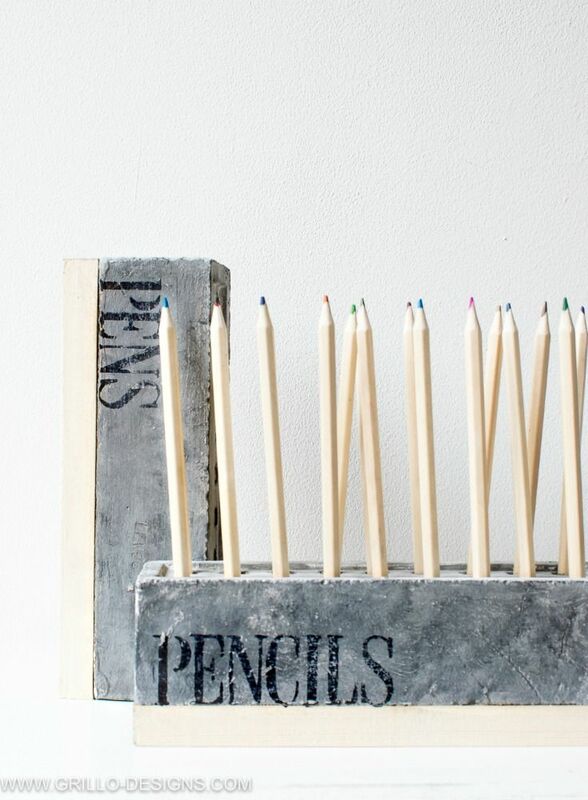 This rustic DIY pencil holder is awesome for a variety of reasons. It’s easy to make, it’s sturdy and durable and it looks cool too. Another great thing about it is that you can make it as big or as small as you want just by cutting the block of wood to the desired length. Make the holes as big as you want by using the appropriate wood bore. 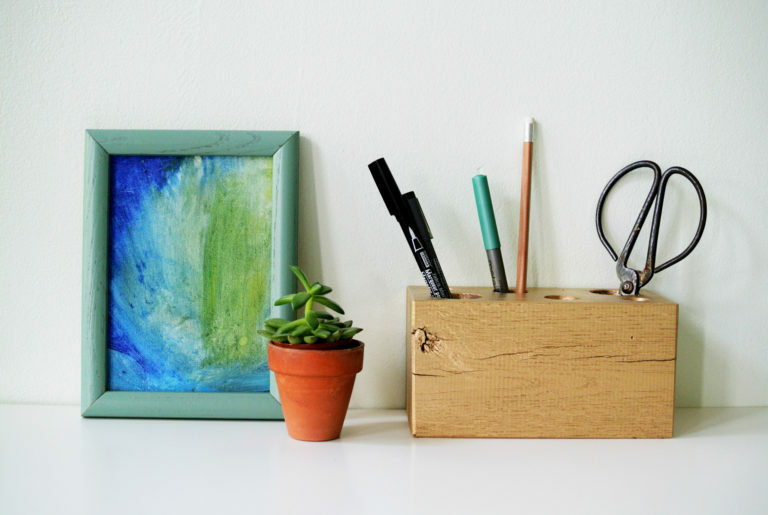 A pencil holder made from a block of wood can also be compact, like this one. This shape and size is suitable for pretty much any regular office space. It can hold a few pens and pencils and even scissors and other small tools but isn’t great for colored pencils or more than a few items. The metallic gold spray paint gives it a very chic look. Check out the full tutorial to find out how to make your own gilded pencil holder from scratch. 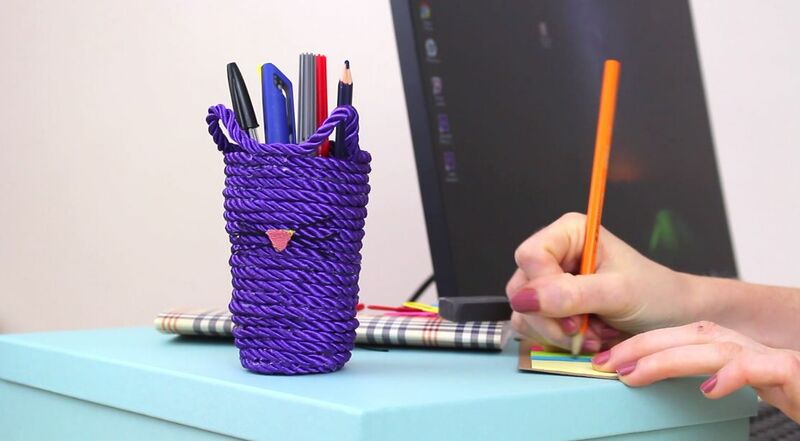 If you want your new DIY pencil holder to be extra cute, you should have a look a this custom kitty rope design. It’s super cute and to make it you only need a few basic things like a glass, some colored rope, a hot glue gun and some black thread for the whiskers plus a tiny bit of felt for that cute little pink nose. 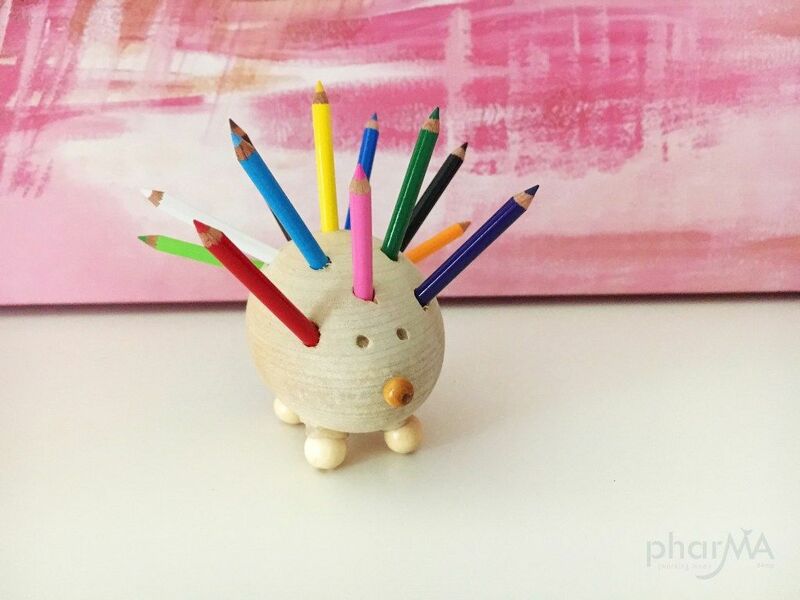 Another cute idea can be to make a pencil holder that looks like a hedgehog. It would come out pretty small since you’d have to use a wooden egg but that only makes it even cuter. In addition to the egg, you’ll also need a drill, four small wooden beads for the legs and another one for the nose and a glue gun. The pencils will act like spikes. You can find all the details about the project in the tutorial featured on phar-ma. Maybe this pencil holder isn’t as adorable as the hedgehog or the kitty ones but it is super chic and easy to make. The idea for its design comes from yourdiyfamily. This pencil holder is made out of 8 gym rings (the 2.67” kind), two popsicle sticks (or some thick card), all secured together with wood glue. 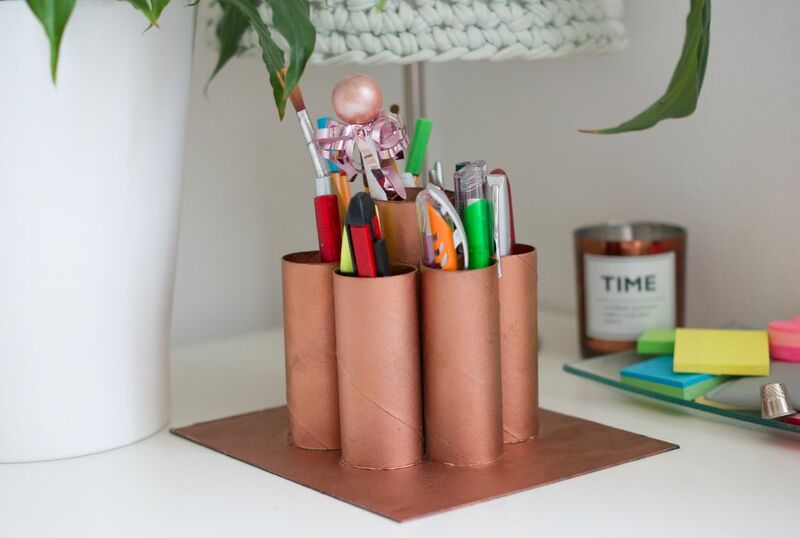 Obviously you can use fewer or more rings or make the pencil holder wider. 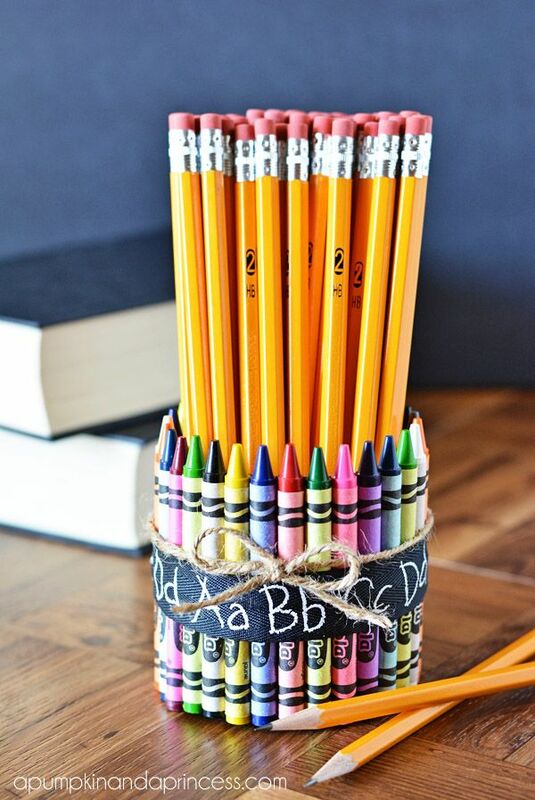 It’s entirely possible to make unique pencil holders out of reclaimed or repurposed objects. In fact, there are a lot of cool ideas in this sense, one of which comes from grillo-designs. Some bricks, as it turns out, have small holes, just big enough for a pencil to fit in. That means you can turn a brick into a pencil holder. To make it look more attractive you can paint it first. You know those cardboard tubes in paper towel rolls? They’re surprisingly strong and sturdy and they’re also perfect for making a pencil holder out of them. Try to find tubes of different sizes so you can mix and match them. Cut them each to the desired length and then group them up, spray paint them and glue them onto a flat piece of cardboard. This unusual but very creative idea comes from yellowgirl. A plastic bottle can be repurposed and reused in a lot of cool ways and one of the most interesting transformation ideas has to do with nothing other than the basic DIY pencil holder. Check out our youtube tutorial to find out how you can use two plastic bottles to make a pencil case with a zipper. It’s easier than you think. Also, you can decorate the case you want to. Air-dry clay is a really cool resource. 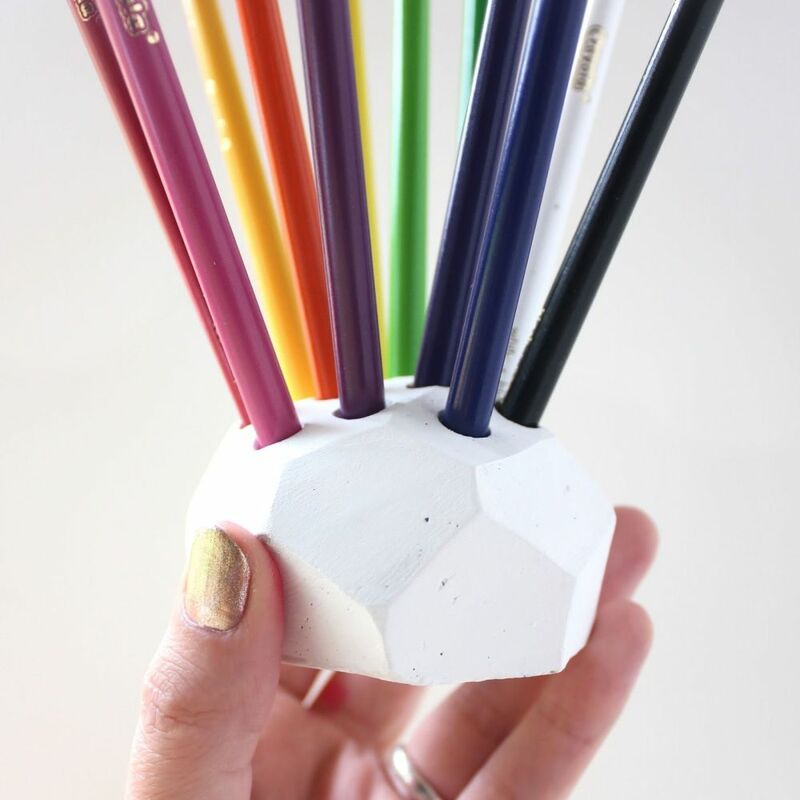 You can use it to make a ton of cool and interesting things, including a geometric pencil holder like the one featured on linesacross. Obviously you can shape yours however you want but we suggest simple geometric forms with symmetric lines because they’re easier to get right. For the holes just use actual pencils while the clay is still soft. 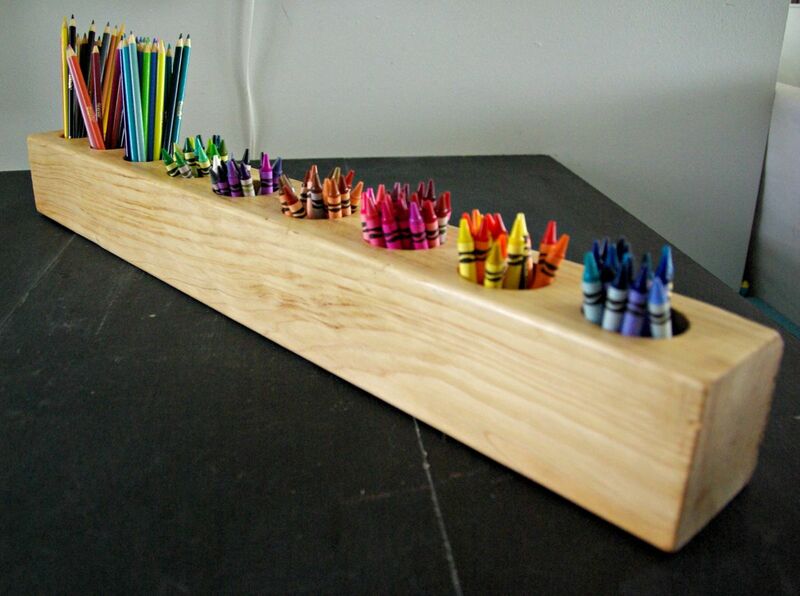 A pencil holder made of pencils…that’s pretty poetic. Actually, the one featured on apumpkinandaprincess is made of crayons but that’s pretty cool too. Of course, there’s more to it than that. What you don’t see in this picture is the fact that all those colored crayons are attached to a tin can using double-sided tape. The ribbon and twine complete the look and also help to keep the crayons in place. You can make this as a cute gift for someone or for yourself. The post 10 Easy Ideas For The Perfect DIY Pencil Holder appeared first on Home Decorating Trends – Homedit.